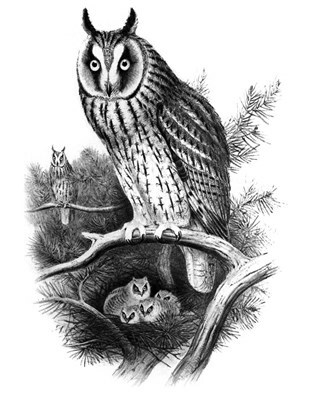 This is a vintage-style etched image of a Long-Eared Owl adult perched on a pine branch. Below the large bird, four small owls lurk in a nest within the tree. Another adult owl is perched in the background. This original vintage sketch of a Long-eared Owl makes a great gift idea for anyone that loves owls! To order by phone, call toll-free at 1-877-809-1659 from Monday - Saturday 9:00am - 9:00pm EST. You'll need to note the Product Number 030-1318830586 to make your order.